The event is going to happen outside Applebee’s and runs this afternoon betwen 4:30 p.m. and 6 p.m. according to organizers. Here’s a Web site promoting more tax day tea parties across the nation. And a photo of the organizer of today’s West Covina event. This entry was posted in Pasadena and tagged West Covina by Frank Girardot. Bookmark the permalink. —In regards to Im guessing her sons board, I couldnt agree more ! 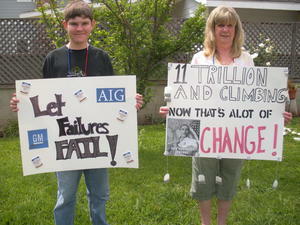 These people are nuts, they are protesting 2008 taxes, in 2008 Bush was pres. Where were they when the republicans ran up historic deficits for 8 years. sheesh. “In regards to Im guessing her sons board, I couldnt agree more !” hahaha you spell bored wrong! Those democrats must be educated =). Plus stop Bush blaming, face reality and understand both house and senate were majority democratic which gave enough votes for tax raises and wars.